Winemakers come to town to put on a show all the time—to talk up their wares and get restaurateurs and wine writers to taste them. They're always interesting—even if the wine isn't that interesting, the mere fact that anyone gets to live that life in their family's 18th-century chateau is enough to get you working on being reincarnated into a winemaking family next time—and they do their best to dance around the ineluctable fact that turning the abstract sensory experience of wine into words never really feels like it works. You know what a really good wine instructor, like the famous Kevin Zraly of the Windows on the World wine school, knows how to do? Drop a word like "strawberries" and, the next sip you take, you say, "Yeah, strawberries." 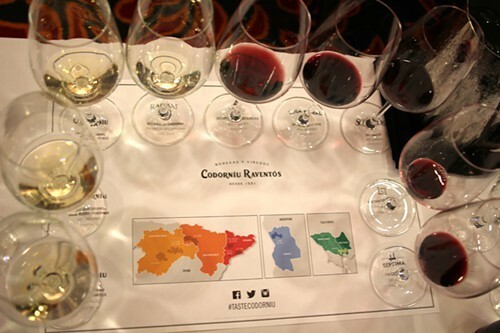 Codorniu Raventos is an international wine company with roots in what is not only an old winery but, we were told, the oldest business of any kind in Spain and the 17th oldest business in Europe, founded in 1551. Winemakers from its properties across half the globe were lined up on a panel at the Blackstone Hotel, but in front of them, holding a mike like he was about to teach us the secrets of success in real estate, was Zraly, and what was on his mind, apparently, was basketball. The room was at least half female and the panel was mostly European (with some Australians thrown in), but the atmosphere kicked off in pure New York sports-bar mode, Zraly good-naturedly busting the balls of the winemakers he's been traveling with. 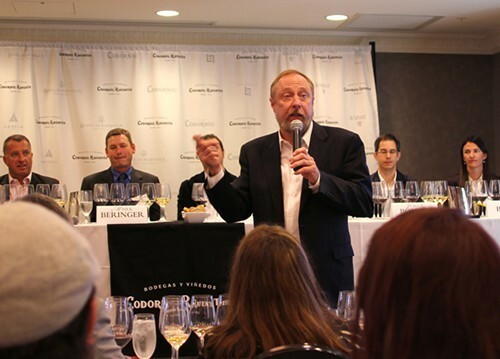 I was eager to see him in action not only because he's one of the biggest names in the world of wine writing and teaching, but because we have a connection, though only in my own mind. When he was a kid he walked into a place as a wine salesman and became its first wine director. When I was a kid and first had money of my own to travel and dine with, I made a reservation at a small restaurant in the middle of Windows on the World called Cellar in the Sky, and ate and drank amid the wines Zraly had selected and cellared, as I set out, very piously, to learn from everything I consumed. In the end, the ethereal name proved all too prescient: Cellar in the Sky's location, on the 107th floor of the north tower of the World Trade Center, is literally open sky now. Zraly had taken the day off for his son's birthday. Though Codorniu trades on its heritage, Zraly was frank about the reality behind Spanish wines, which is that they went as fallow as everything else in the Franco years. "Spanish wines were terrible, terrible wines, and I know, because I tasted them," he said. "They had to unlearn everything and relearn everything." Each of us had nine wine glasses, four whites and five reds, arranged on a paper mat under which the wine's name and vintage was printed; plus a water glass and a plastic spit cup. We started with three cavas, Spanish sparkling wine made in the "methode Champenoise" (which Codorniu claims to have been the first in Spain to use). The first, Gran Codorniu Xarello Gran Reserva 2007, was 100 percent Xarello, a relatively little-known Catalonian varietal. It was like taking a sip of a sour beer first thing at a bar, startling to begin with in its strength and acidic bite. I wondered at the logic of starting us with something so strong—surely it would blow more delicate flavors away. The logic became clearer though as we tasted the second, Gran Codorniu Chardonnay Gran Reserva 2007, 100 percent Chardonnay. This was the first wine's opposite, gentle and with hints of peaches and flowers. The third, Gran Codorniu Pinot Noir Gran Reserva 2007, had little of the character of either of the others, but then we tasted a still 50/50 blend of the two grapes, Raimat 2013 Xarello Chardonnay—and surprisingly the acidity and punch of the Xarello was almost totally subsumed by the mellow melon flavors of the chardonnay. In the meantime Zraly had urged us to talk with our neighbors, like a priest introducing parishioners to the handshake in the New Mass, and mine, a beverage director from a hotel, agreed that it was a shame to have lost Xarello's bite, which by now made its absence keenly felt. We weren't surprised a minute later when the winemakers admitted that next year, they were going to experiment with upping the percentage of the more acidic grape. As much of a shock as that first taste of pure Xarello had been, I'll at least seek it out in the future. The first of the reds was from their California property, Artesa in Carneros in Napa, Block 91D 2012 Pinot Noir. Artesa may not be a famous name, but the winemaker bore one himself—Mark Beringer, great-great-grandson of the founder of one of Napa's biggest wineries. The claim had been made earlier that their goal as a company was not to manipulate the wines too much, adding a bit of this and a bit of that in blending process to reach some predetermined notion, but after hearing how they treated the same varietal by five different methods of fermentation, it was hard not to think that they were approaching the same degree of flavor manipulation by other means. And the wine, smooth and featureless as Coach leather, bore this out. "It's too perfect to be interesting," I said to my neighbor, and he chuckled and seemed to agree, so I felt smart. Back to Spain for the next reds—and here were wines with exactly the kind of character, like the weather-beaten face of a peasant, that the Botoxed California wine lacked. They were all too young to be fully opened up, but already they had the complexity to tell you they'd be delivering more with some aging, and they were everything you would want from Spanish wine. As Zraly pointed out, the winery, whose name means "Ladder of God," could also be translated as "Stairway to Heaven." He dared someone in the audience to sing the first verse, and someone in the row opposite mine gave it a shot as Zraly, whose presentation had threatened to go off the rails on one of his humorous tangents more than once, wrapped it up right as the buzzer signaled that the clock had run out.